This isn't decluttering in the normal sense of the word, but it's just as effective since it gets items out of our cupboards or storage rooms. We often have consumable items in our home that we are saving for another time or that we don't think about actually using up. But if we're not using them then they've become clutter. Hotel toiletries you were saving for travel or fancy soaps you were saving for guests can be used by your family instead of cluttering up your bathroom cabinets. And as a bonus you save money because you don't have to purchase those items for yourself as often. Pull them out of your cabinets and gather them all in one place. Then make a point of using them up before buying any full-sized toiletries. Get your whole family on board and they will disappear before you know it! Candles can be burned instead of becoming decor items that collect dust. In the 365 Items in 365 Days Facebook group we had a discussion awhile ago about using up things we'd been saving for a long time. One participant shared that she was burning a candle from her wedding 8 1/2 years ago. She'd been hanging onto it through 6 moves and finally decided to burn it. Her husband noticed and asked her how much interest that candle had earned over the years she'd kept it. Answer... none! We don't gain anything by keeping some things we could be using. As she burned her candle she was able to remember that special day and enjoy the fact that she was reducing the clutter in her home. Win win! Food in your pantry can be eaten. This may be obvious, but you may be surprised at what's hiding in the back of your pantry that can be used up! Things you stocked up on while they were on sale but haven't used up yet. Or food items that were gifts that you haven't gotten around to eating yet. Go through your kitchen and take note of everything that you haven't used in awhile and make a plan to use it up before it expires. Of course, while you're at it, you can toss anything that's expired or donate anything you know you won't use to a food bank (as long as it's not expired or expiring very soon). Once these items are used up you'll have more space in your home. Make a point of continuing to use up consumable items rather than storing them for a later date. What consumable items do you have in your home that you can use up as a way of "decluttering"? Here's your chance to make a little money while decluttering :) Go through your attic, storage room, garage, or the back of your closets and find items you no longer use and that are worth something. Take them to a consignment store or take pictures and list them online so they are no longer cluttering up your home. If you have a lot of items to sell you could consider a garage sale. However you sell them, your items will be enjoyed by someone else instead of collecting dust in your basement and you'll make a bit of money in the process! Sporting equipment - if your child no longer plays a sport, or has outgrown their equipment, sell their old equipment to get it out of your home - places like Play It Again Sports are great for this. Baby gear - if you're past the baby stage in your home sell all your Bumbos, exersaucers, high chairs, strollers, etc. These items take up a lot of space and there are always new parents looking for deals on quality used items. Once Upon a Child is a great place for selling baby gear. Make sure to check for expiry dates and recalls. Also note that some consignment stores will not sell used baby items like car seats and cribs for safety reasons. CD's, DVD's, video games, etc. - there are lots of used entertainment stores where you can get money for items you may not be using any more. Note: if you've digitized your collection from a hard-copy CD/DVD, you need to keep the original according to copyright laws (or delete the digital versions if you want to get rid of the hard-copy version). To avoid having to do this you can purchase the digital versions and declutter the hard-copy versions. It's always great to make a little money while decluttering :) What else can you sell instead of having it add to the clutter in your home? Take a few minutes to go through your closets and dressers to find items that don't fit anymore. Donate them to your favourite charity or give them to someone who can use them. If you have kids, check their clothes for any they've outgrown. The younger they are the more you'll probably find since they grow so quickly. Also look for off-season clothing that won't fit them by the next time that season comes around. If you or your spouse have gained weight, let go of those "too small" clothes. Even if you're working on losing weight, chances are your body won't be the same shape as it was before and your clothes won't fit the same way they used to. And it's always a nice reward after losing weight to go shopping! If you feel you want to keep some favourite items as motivation to keep losing weight, just keep 1-2 outfits. Otherwise all those "too small" clothes are a constant reminder of your former self and can actually discourage you more than motivate you. Similarly, if you've lost weight, let go of the bigger clothes that no longer fit. It can be tempting to hang onto them in case you gain weight again or because they're just really comfy, but it's like you're allowing yourself permission to gain weight again. You won't even notice you're gaining weight again because the clothes are bigger and still fit. The exception is if your weight is fluctuating due to health concerns or pregnancy. Otherwise, let them go. 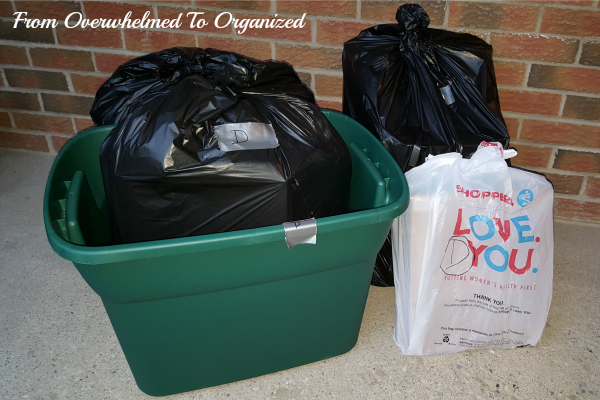 Often when we're decluttering we add things to a donation box or a "to sell" bin. And that makes sense... it's more practical to take a full box of donations to a charity than to take a few items here and there. Or to list a bunch of items for sale at once, rather than a few here and a few there. BUT, make sure you're actually getting your decluttered items out of your home on a regular basis. Otherwise you haven't really decluttered them! I typically keep donations in my dining room for a few weeks until the next pick-up date from several charities that I'm on the call list for. Then I gather everything up and set it out on the scheduled pick-up date and it's gone. I love that feeling! 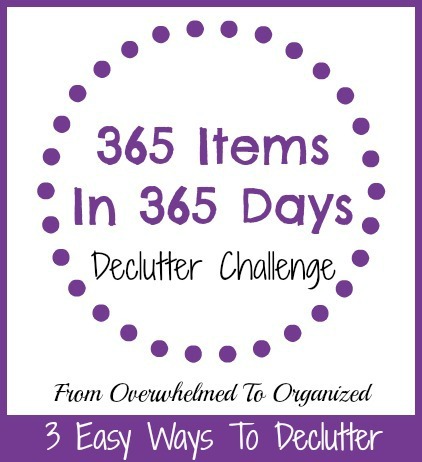 Declutter and Get Organized This Year! If this is the year that you want to really declutter and get organized, then you're in the right place! I'll continue sharing tips and inspiration all year :) I'll also recommend some helpful products from time to time that will help you go from overwhelmed to organized. Like this sale coming up that I'm super excited about! It's full of ebooks and resources to help you declutter and get organized! I've promoted super bundles from the Ultimate Bundles gang before and they really do a great job of grouping amazing resources together for one greatly reduced rate. But these sales only run for a few days. The Conquer Your Clutter Super Bundle Sale starts tomorrow (Wednesday Jan 25th). I'll have all the details available then so you can grab your bundle before it's gone. But for now... get excited! I've read a bunch of the ebooks included in this bundle and I know they can help you declutter and get organized! Note: I'm an affiliate for this sale, so if you purchase a bundle through one of my links, I'll earn a commission. However, I only promote products I know can help you go from overwhelmed to organized. I appreciate your support, and commissions like these help me keep everything on this site free, including the 365 Items in 365 Days challenge. Thanks! Here's to a great year of decluttering and organizing! Which of the 3 ways of decluttering will you do first? What items in your home can you use up as a way of "decluttering" them? What things can you sell? What clothing can you donate or give away that no longer fits? Use things up. Wow, what a simple, practical suggestion that makes so much sense. Love this post! Isn't it funny how some things are so obvious yet we just don't think of them Natalie?! I'm with Natalie. Use things up is such a great tip. Just use up the 4 paper plates leftover from your Superbowl party. You'll have to buy more for next year's party anyhow, so just drop them on top of your regular plates and use them! Using things up, i am with Seana and Natalie, i used to keep my candles just for when the power went out, now i use them regularly, great tip. Yep! I used to have a drawer full of candles... now I just have enough for an emergency but otherwise we use them as we receive them. Thanks for the curb alert suggestion Sarah! I've done that with Freecycle (and yes stuff disappears very quickly!) but I didn't realize you could do it on Craigslist too. That's great!